This weeks wine for the weekend is vodka made from wine grapes. This vodka is a distilled spirit that qualifies as a festive holiday option instead of wine. Unique to Washington and the the world Grapeworks Distilling is making vodka from single wine grape varietals like chenin blanc, riesling, gewürztraminer, and pinot gris. Ciroc, made famous by brand ambassador P-Diddy, is a vodka from France that makes vodka from wine grapes, also, but they use a blend of grapes. Wine grapes destined for vodka follow a similar process to the grapes destined for wine. Once harvested they go through crush and fermentation. Grapeworks sources wine grapes from their own vineyard in Yakima. After fermentation the juice is brought to Woodinville and distilled into vodka using a very fancy, state of the art, Kothe Vodka Still. Each wine grape imparts it’s own flavor profile to the vodka with flavors ranging from tart citrus and sweet pineapple, to earthy, peppery, spice. The riesling vodka is nothing like riesling wine it is smooth with sweet citrus and floral flavors. The gewürztraminer is not sweet at all but very smooth with notes of pepper. Sip solo or add to your favorite cocktail or try Food 52’s horseradish bloody Mary made with Grapeworks gewürztraminer vodka for your next holiday brunch. 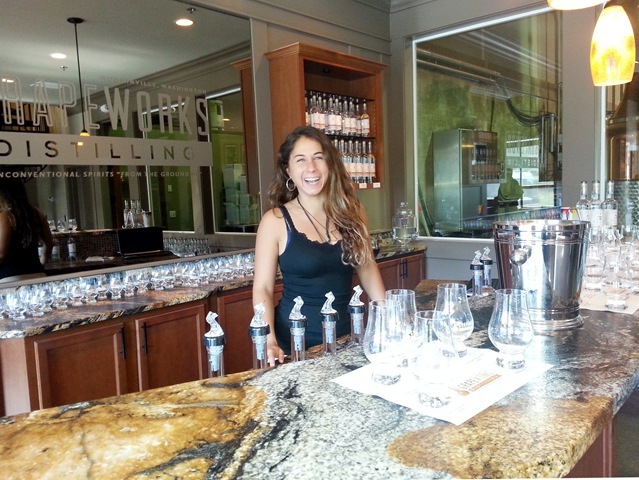 Grapeworks Distilling took over Woodinville Whiskey’s old location at 16110 Woodinville-Redmond Rd NE. They are open Friday through Sunday noon-5 p.m.